The wall-sized mural [itself] – titled, ”A shenere un besere velt,” according to the Mural Conservancy of Los Angeles (a Yiddish phrase meaning, “A more beautiful and better world) – depicts cultural, biblical and historical imagery. The imagery includes a menorah, Israelites wandering in the desert, a young girl waving Israeli and American flags, and more. What would your reaction be upon seeing it? Unfortunately, some people are still in the dark about the significance of this, and similar acts. 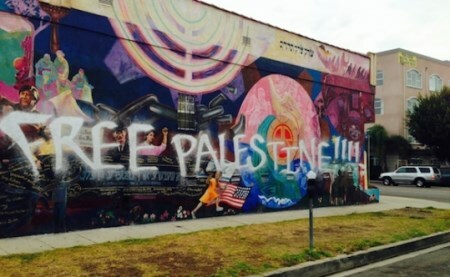 Robert Adler-Peckerar, executive director of the L.A.-based organization Yiddishkayt, which is a frequent collaborator with the national office and local branch of Workmen’s Circle, said the message of the graffiti reflects an ignorance about the mission of the victimized group. He described Workmen’s Circle as being historically committed to ideas of “social progress, equality, human rights, civil rights and the general pursuit of human dignity,” which includes promoting a “progressive, peaceful solution to the Israeli-Palestinian conflict,” he said. The director is wrong. The vandals were not ‘ignorant’ or ‘thoughtless’. They fully understood the connection of the Palestinian Cause to the destruction of the Jewish State, and the relationship of the Jewish state to the continued existence of the Jewish people. The graffiti expresses their negation of both Zionism and the Jewish people. The apparent belief of the director that the Palestinian Cause that the vandals espouse has anything to do with “social progress, equality, human rights, civil rights and the general pursuit of human dignity” rather than racism and a desire to commit genocide, is a good example of another kind of illiteracy — the political illiteracy which prevents ‘progressive’ Jews from reading the ugly truth in front of their faces. Rowhani’s comment about Israel being a ‘sore’ (whether or not he added that it should be removed) expresses a popular meme in the Muslim world. The idea is expressed explicitly in the Hamas covenant, and it often appears in PLO media. Palestinian Journalist Khalid Amayreh published an article in 2010 on an Egyptian Muslim Brotherhood website in which he called Jews “an abomination, a cancer upon the world.” Hizballah leader Hassan Nasrallah on Friday called Israel a “cancerous gland” which must be “excised,” echoing Iranian Supreme Leader Ali Khamenei. Other Iranian officials also use this language on a regular basis. The idea persists, despite the fact that — by any objective standard — the behavior of Israel is anything but expansionist and invasive. Although Israel ‘grew’ at the expense of the Arab nations in 1967, it has eagerly abandoned most of the territory conquered in the name of ‘peace’, even when that goal proved illusory. It would probably have given it all up if the Arabs had been more focused on strategic advantage than honor and vengeance. Since 1948, the Arabs (and from 1979, the Iranian regime) have persisted in trying to ‘cure’ the Jewish ‘cancer’, sometimes by war, sometimes by diplomacy and often by both at once. The Arabs seem to have learned by successive humiliations (which only deepen their hatred) that direct means will not be successful. Now they have adopted a multi-pronged strategy of military pressure combined with delegitimization to reduce Western support for Israel, along with diplomatic offensives at the UN and with the US to obtain a solid territorial base. Once this is achieved, they expect to finish the job in another regional war. The Arabs in particular have never been terribly original. First they borrowed the anti-Jewish ideology of the Nazis, exemplified by Palestinian Arab leader al-Husseini’s relationship with Hitler and the Nazi scientists and war criminals who found sanctuary in Egypt, Iraq and Syria after the war. The rest of the world was understandably repelled by Nazi ideology, but in the late 1960’s Yasser Arafat was instructed by the KGB to present his gang as a movement of national liberation for a distinct ‘Palestinian people’, and Zionism as a form of imperialism. The international Left followed the KGB’s lead, and this marked the beginning of the Left’s fanatic anti-Zionism. Since then the campaign has expanded greatly, despite the complete absence of parallels between Israel and apartheid South Africa. 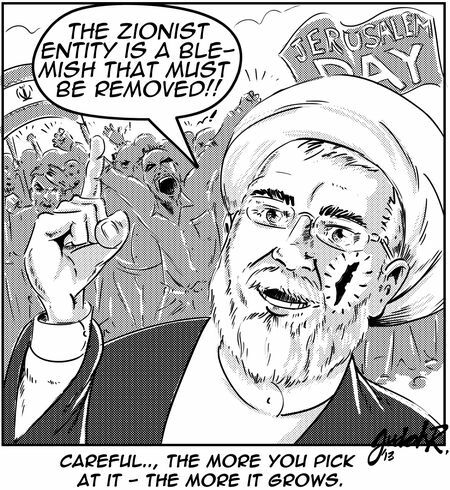 It’s important to understand — and the cancer imagery makes this clear — that despite the various guises that the Arab-Muslim-Palestinian cause affects, there is one basic element that underlies it: an extreme hatred of the Jewish people and the desire for another genocide against it. In this they will be unlikely to succeed — unless Israel first tears itself apart by internal conflict. 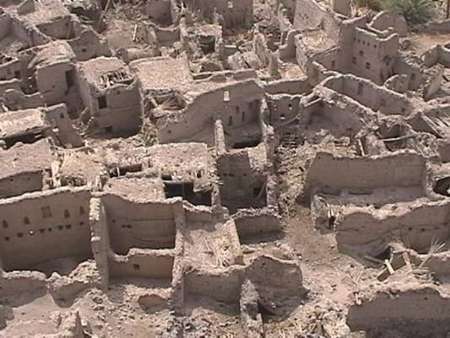 Egyptian TV is planning to broadcast a new series during Ramadan in July: Khaybar, the story of a battle fought in 629 by the prophet Mohammed against the Jews of Khaybar, an oasis in northwestern Arabia. After a vicious battle in which many Jews were killed, women and children were made slaves (Mohammed himself took the wife of one of the leaders). A few Jews were allowed to remain on the condition that they give half of their produce to the Muslims. Muslim demonstrators today like to chant “khaybar, khaybar ya yahud, jaish muhammad saya’ud, Khaybar, Khaybar, O Jews, Mohammed’s army will return,” to remind us of the historic event and to threaten a replay of it. The promotion of anti-Semitic themes in the Egyptian media has been a long-standing and ominous problem. In 2002-2003, Egyptian television produced a 40-part series, Rider Without a Horse, dramatizing the classic anti-Semitic tract, The Protocols of the Elders of Zion. The program depicts Jews murdering a gentile child to use his blood in making of Passover matzah. It’s easy to think “who cares, it’s normal in that part of the world, it doesn’t mean anything special.” But it does. Like the daily demonization of Jews and Israel in the Palestinian Authority and Hamas media, like the constant invention and exaggeration of stories of mistreatment of Palestinian Arabs by multiple European-funded NGOs, and like the lie factory that is the UN — here’s a particularly egregious example which is in the news today — anti-Jewish and anti-Israel hate propaganda in Egypt and other Arab countries represents an early stage of a hoped-for genocide against the Jewish people. It is also easy to feel confident that Egypt, which is on the verge of starvation and probably soon to face a military coup, doesn’t have the ability to hurt Israel, nor many Jews of its own. But hate is cumulative over time, and spreads efficiently in Internet space. It is past time for the Jewish people to say that they are not going to take this anymore, that there will be consequences for countries and institutions that don’t take steps to stop it. Egypt, for example, doesn’t have sufficient energy reserves to meet its needs, nor does it have the foreign currency to buy oil and gas. Israel will shortly have more gas than it can use. Should it sell some to Egypt, when that country in essence calls for another genocide against Jews? Egypt needs help everywhere it can get it, and the US will certainly be a major source of aid when Egypt’s economy collapses altogether. This could be a test case to find out if the Obama Administration really means what it says about its opposition to racism and incitement to murder. Today is Holocaust Remembrance Day, and I’m troubled. 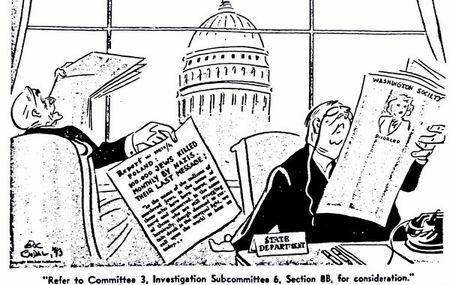 History is important, because justice today depends on a correct understanding of yesterday. If your vision of the past is distorted, then your objectives for the future and present actions can be morally wrong, pragmatically futile, or both. If you don’t believe this, think about the consequences of the false Arab and leftist narratives about Israel and ‘Palestine’. Therefore, understanding what Hitler did to the Jewish people, what historical trends led up to it and how the world responded, is critical for all of us today. There needs to be a Holocaust remembrance Day and it ought to tell its story in detail, over and over to each generation of humanity, and not just to Jews and Europeans. But certain ways of observing this day make me very uncomfortable. One is what I call the ‘universal kumbaya Holocaust observance’. The message here is that there are lots of genocides, they are all similar, and we have to try to understand our fellow man in order to prevent them. I went to an event once in which it was said that the real Holocaust encompassed 11 million people — Jews, Gypsies, gays, disabled and mentally ill people, etc. I didn’t understand how they got to 11 million, nor why they stopped there: about 60 million people died as a result of WWII, probably about half of those in the European theater. Estimates range from 10 to 20 million Chinese dead in the conflict with Japan. Perhaps they should have lit 30 candles for the evil done by Hitler, and added another 30 for Imperial Japan? The trouble with a universalized observance is that it obscures the significance of the specifically Jewish genocide, the fact that the Holocaust was the perfection, made possible by modern technology and careful planning, of the pogrom, the culmination of the hundreds of anti-Jewish murders committed over the centuries simply because the victims were Jews, as the Nazis said, a final pogrom which would, for once and for all, erase the Jews from the world. And by hiding the meaning of this event in plain sight, as it were, among all the other horrors of war, it also absolves today’s Jews from the responsibility to find their own solution to the specifically Jewish problem of endemic Jew-hatred, which has not gone away. Another kind of Holocaust observance is the ’emotional binge’, in which participants try to bring themselves to the point where they can almost feel the doors of the gas chambers closing on themselves or (worse) their children, in order to fully internalize the ‘real meaning’ of the Holocaust. These events include talks by survivors about their experiences, dramatic performances and even re-enactments in which participants play the role of Jews and Nazis (all of these have been done in my community). The common characteristic is that they are intended to evoke the strongest possible emotional responses. The catharsis provided by emotional binges is greatly enjoyed by some people, but it adds nothing to the understanding of history. Indeed, it creates a dangerous fixation on the dead Jews of the 1940s, to the detriment of those living today. Finally there is the ‘symbolic but trivializing gesture’. A local synagogue is attempting to collect 6,000,000 buttons in remembrance of the 6,000,000 Jewish victims of Hitler. It was explained that this is a big number, and the stack of buttons that they will make will help people visualize the extent of the Holocaust. It’s hard to comment on something quite this silly. Collecting, storing and displaying that many buttons is a large effort, which one imagines could be exerted to much more effect in some other way. Personally, I have no problem visualizing 6,000,000 people: I just think about the Jewish population of today’s state of Israel. Which brings me to the general problem I have with all of these ways of commemorating the victims of the Holocaust. They are entirely consistent with total ignorance of the real lesson of the Holocaust for Jews, which is not that 6,000,000 is a big number, or that the death of a child is horrible, or that genocide is bad everywhere, in Rwanda or Armenia or anywhere else. This is why it is possible for some Jews to light candles, cry, and ‘dialogue’ about the need for cross-cultural understanding with non-Jews until the cows come home, and then go out and (for example) join a demonstration against Jews moving into eastern Jerusalem. The Jewish lesson of the Holocaust is this: Jew hatred is real, it is dangerous, and it is not possible for Jews to depend on others, no matter how well-intentioned they may seem, to protect them. For almost two thousand years, the Jewish people depended on others, and the result was periods of tolerance interspersed with persecutions, expulsions and murder. Generations of Jews have learned this lesson from events: Herzl learned it from the Dreyfus case, and Jabotinsky from the Kishniev pogrom of 1903. Unfortunately, the history of modern Israel is also filled with such ‘teaching moments’. There is a solution to the problem. It doesn’t end Jew-hatred and it doesn’t absolutely guarantee Jewish survival. But it is the best chance for the latter, in both the physical and cultural senses. It is, of course, Jewish independence — that is, Zionism. So here is my idea for an appropriate Holocaust remembrance event: a teach-in on the subject of Jewish history, in which people would learn not only what Hitler did, but why, and how this was part of a long tradition of evil. And it wouldn’t hurt to add a discussion of the history of Zionism and the state of Israel, to counteract the poisonous Arab narrative. Because acting justly in the present requires correctly remembering the past.